A recent posting to the 'ndblist group' by Mike, an ardent NDB DXer in the UK (Sussex), announced the recent completion of his four-part video series describing the installation and testing of a new PAØRDT active antenna. If you may be contemplating the installation of an active antenna such as this, or perhaps making a start at DXing the NDB band or listening on 630m, then you might enjoy following Mike's journey as he demonstrates that living in the noisy suburbs need not keep you from enjoying the LF/MF bands. Mike includes some interesting tests involving his grounding system versus noise ingress and the results of keeping the electrical main's ground isolated (or not) from the antenna cable's ground. 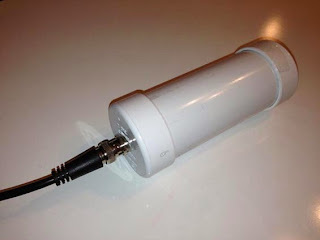 The PAØRDT active whip is available from PAØRDT himself or if you are handy with a soldering iron, you might choose to build the same antenna in your workshop. These simple yet highly effective receiving antennas are being used successfully by hundreds of listeners all over the world and for their size provide some pretty amazing performance. Much more information on the PAØRDT e-probe antenna may be found here in a previous blog posting. To see more of Mike's videos, you can visit his interesting Youtube Channel here. 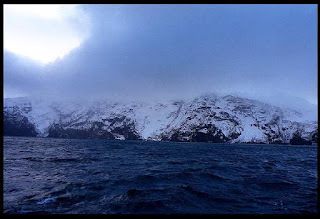 Operations from the South Sandwich Islands (Thule) has caused a lot of excitement on the bands over the past ten days ... but for myself, it was more of a last-minute frenzy, which I'll elaborate on later. The expedition, composed of a crew of 14 operators from the 'Intrepid DX Group', left Port Stanley in the Falkland Islands aboard the MV Braveheart, on a 38-day roundtrip to South Sandwich and then to South Georgia ... two of the rarest DX entities on the planet, and by any standard, not the easiest places to reach! Today at 21:20 UTC, Nigel Jolly, Braveheart owner, declared an emergency and ordered to VP8STI team to cease all operations and return to the ship. A large ice flow that had broken away due last nights storm starts to block the entrance to the Bay where they were camped. There was strong potential for the ice flow to prevent Braveheart to get them. Team is now safely aboard the Braveheart and they are moving away from Southern Thule Is. All the equipment and personal gear is still on the island. They hope to return to camp site during next good weather window. Once they retrieve their equipment, they could make a determination as to whether they can proceed to South Georgia to do VP8SGI as planned. I had been aware of the expedition but had not been paying too much attention ... after checking my master DXCC checklist and finding that I had already worked South Sandwich on 160m, several years ago, I didn't really need it. I'm not sure why I checked my list again on the 25th but when I did, I realized that I had really messed-up ... it was actually South Georgia that I had worked on 160 and not South Sandwich! I had never worked South Sandwich, on any band, and it was one of the last 9 entities that I needed for having worked them all ... big mistake. I soon realized that operations on South Sandwich would be coming to a screeching halt at any moment and scrambled to see where they were presently operating. Unfortunately they seemed to spend most of the day (25th) on the WARC bands, for which I have no antennas ... I really need to hang a 30m dipole up in the trees one of these days for situations just like this. 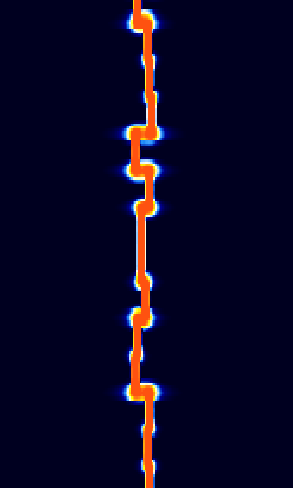 As darkness approached VE7 land, I began seeing a few spots for them on 20m phone, not my favorite mode, nor the most efficient for working pileups. Zeroing-in on their frequency found them with a nice 5x7 signal on 14.180kHz and listening from 14.235 - 14.245kHz. The operator was working North America by call districts and when I tuned-in, was working "Ø" 's. He would work ten stations and then change. He started on down the list, calling for "9" 's and then "8" 's but when he had finished with them, he called for "1" 's ... hmm. Perhaps he had started with "7" 's before I arrived and was working his way through the list once again. It seemed to take forever when he had finally finished with the "6" 's and his signal was now considerably weaker ... "7" 's should be next. But no ... it was even better! Luckily I had been following his tuning technique as he worked through the pileup and was able to track his listening frequency as he worked his way from 14.235 to 14.245 and back again. I had my transmit frequency already set on the frequency of the last "6" that he had worked ... when he called for "any VE's?" ... as luck would have it, he came back on my first call, not only making my day but making my week! After a bit of a scare, I was very fortunate to work them on what turned out to be their last full day of operation, as they left the air, and South Sandwich, after only a few more hours of operation. From now on I'll be checking my list much more carefully. As has been the case for much of this winter's DX season, LF conditions were very erratic during this past weekend's CLE NDB-listening event. Geomagnetic activity fluctuated wildly from hour to hour, gradually settling down for Sunday night's last opportunity, with K-indices dropping to 1's or Ø's. With the DST slowly climbing towards positive numbers after a week of coronal hole streaming and auroral absorption, I had hoped that Sunday night's conditions would be a bit better than they were ... although poor, it was the better of the three nights. Participants in the central and southern states noted excellent conditions and were not as badly affected as listeners to the north, where the effects of any auroral activity are sudden and much more severe ... I'm always surprised at just how much difference one or two hundred miles further to the south can make. The following NDB's were heard over the course of the weekend, all using the Perseus SDR to record two-minute grabs, every hour, from dusk through dawn. Going over the recordings takes some time but being able to, in effect, listen all night, readilly illustrates how much the band conditions on LF can change so drastically from hour-to-hour ... sometimes for better and sometimes for worse. It will be nice to see a 'quiet sun' once again, hopefully sooner than later. 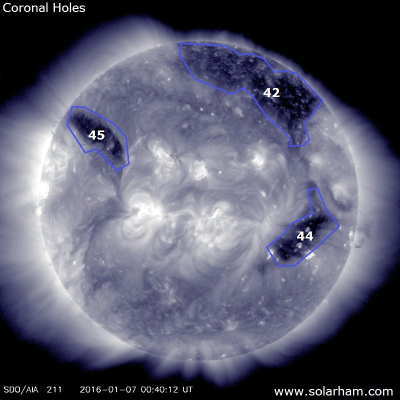 For such a wimpy solar cycle, this one is not going down without a valiant fight, as it continues to mess-up LF and MF propagation, with an almost non-stop bombardment of coronal hole streams. A recent link posted on the ON4KST 2200/630m chat page brought up a very helpful web site. 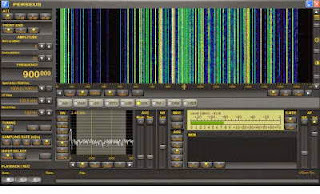 The Sigidwiki site lists examples of the various transmission modes being used from LF to UHF, along with examples of what these signals look like on a waterfall display. With the proliferation of digital modes found on-the-air today, it's often fairly baffling, trying to figure out what you are hearing. The main database page contains a staggering 272 different identified modes of transmitting information, in one way or another ... no wonder it's hard to keep track! 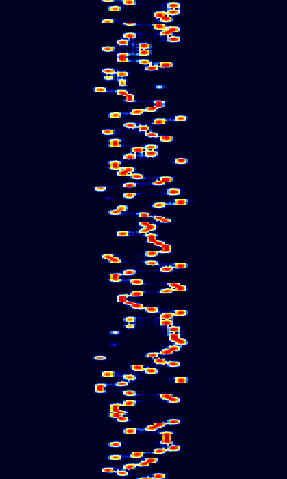 Clicking on any of the modes will bring up more details about the mode, sometimes with links to the decoding software and further reading. I'm sure there are more that aren't on the list (is WSPR there or did I just miss it?) but it's still an impressive and helpful collection for those that use a waterfall display on their receivers. This coming weekend will see another CLE challenge, this time in the 20 kHz slice from 350.0 - 369.9 kHz. A nice catch for North American listeners, as well as for over-the-pole Europeans, is 'RB' - 350kHz, in Resolute By, Nunavut. Its big 3,000-watt signal has been heard all over Europe and in NA from Hawaii to New England. 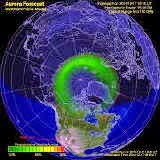 If you haven't participated in one of the monthly CLE activities before, this midwinter event might be just the right time to get started ... the low geomagnetic activity of late looks very encouraging. frequencies in that range, plus any UNIDs that you come across there. We last concentrated on these frequencies during CLE186 in Sept 2014.
http://www.ndblist.info/cle.htm including access to the CLE203 seeklists (soon) for your part of the World prepared from the loggings on Rxx. As much as I love CW and try and promote its use on 630m, one cannot deny the growing interest and use of the WSPR mode on our newest ham band. Its ability to dig deep into the noise and successfully decode signals as weak as -30db makes it an attractive method of watching the night-to-night and hour-to-hour propagation magic. One only needs to check the number of stations logged into the WSPRnet Activity-page, uploading 630m spots each night ... a typical evening will see 60-80 calls listed. The main problem with WSPR is that it's a one-way, beacon-only mode and it's not possible to utilize it for a valid two-way contact. It's nice to know that station 'A' is able to hear station 'B', and vice-versa, but the only way for both stations to know this is for them to both be monitoring the internet uploads ... if both stations were able to confirm their respective receptions all via radio, then a two-way contact could be claimed. Thankfully, there is another mode that solves this dilemma, without internet intervention and that's JT9. 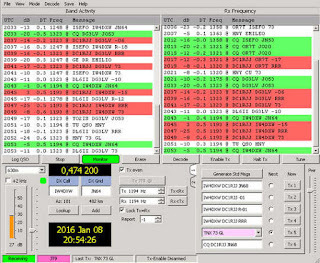 JT9, developed by K1JT, is a spin off from his JT65 weak signal QSO-mode software developed for EME. JT9 has been tailored for the noisier HF and MF bands and is apparently, about 2db more sensitive than JT65. In the past, I have made several single-yagi EME contacts on 2m using JT65, with many of these QSO's being in the -27 to -29 db range. This would suggest that 630m JT9 contacts could be made at signal levels as weak as -30db! A recent "630m Activity Weekend" in Europe turned out be a "630m JT9 QSO Party" with dozens of Europeans working each other throughout the event using this weak signal mode with great success. It looks very much as if JT9 may now be the go-to mode for two-way work on 630m when, as is often the case, signals can be easily seen on a visual waterfall display, but are too weak to be heard on CW. 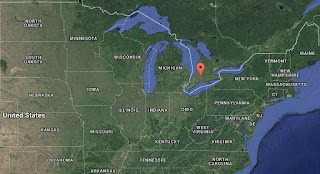 On this side of the Atlantic, recent JT9 contacts have been made between several of the U.S. experimental stations. 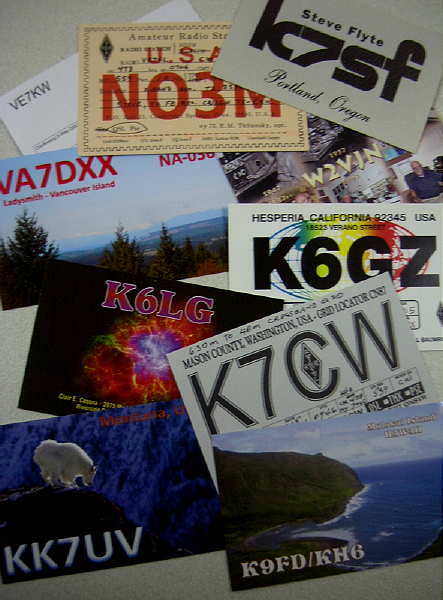 WH2XCR in Hawaii (K9FD/KH6) and WG2XIQ in Texas (KB5NJD) worked on Dec 9th, while WH2XGP (W7IUV), WG2XSV (W0YSE/7) and others have been exploiting the power of JT9 to work around the country. Such has been the case for me recently, with the arrival of VE3OT on 630m. 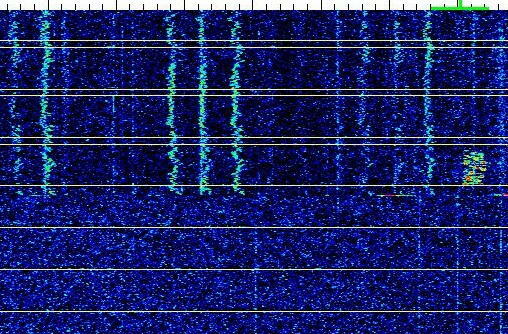 Since beginning his nightly slow speed CW, QRSS6 beaconing, his signals have been easily visible here every night but only strong enough to hear aurally, on two occasions. It is likely that we could work each other fairly routinely on JT9 but will need to wait for very good conditions to work on CW. The good thing about modes such as WSPR and JT9 is that they can be used without the need for linear amplifiers in the PA ... class D or E amplifiers, fairly universal in the LF/MF world, can be employed. The most popular route at present seems to be via a homebrew transverter that will allow the use of the station's main HF transceiver (using the tone-generating JT9 / WSPR software) to generate the required 630m RF. 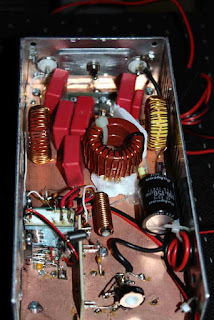 I've been looking for a new radio workbench project to catch my interest and building a 630m transmitting converter is beginning to look more attractive, now that we have another DX target in VE3 land ... of course, if and when the U.S.A. gets the band, there will be an entire new crew of stations spread across the continent to keep the transverter busy! Following late fall's very successful 630m Activity / CW Crossband Weekend in November, several enquiries were soon received asking "when's the next one?" I'm happy to announce that the 'next one' will be held on the first weekend of February and will follow a similar format. US and Canadian radio amateurs and experimenters will join forces in February for the first Midwinter 630 Meter Activity Weekend. The event will get under way on February 6 at 0000 UTC (Friday, February 5, in US time zones) and run through 2359 UTC on February 7. 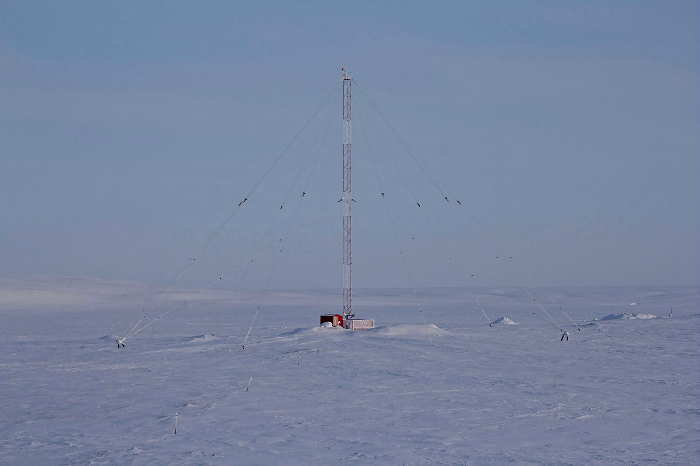 “This event is being undertaken because of the new and quickly growing interest in present 630 meter activities, both in the US and Canada,” said ARRL 600 Meter Experimental Group (WD2XSH) Experiment Coordinator Fritz Raab, W1FR. “Much of the interest is in response to the strong likelihood of US amateurs receiving access to the band in the near future, while Canadian hams are eager to learn more about the present level of Amateur Radio activity on their newest ham band.” The activity weekend comes on the heels of a special event operation over the November 13-14 weekend that included participation by US and Canadian radio amateurs.and the Maritime Radio Historical Society (MRHS). Operation will be from 472 kHz to 479kHz in various modes. The two-way crossband work will be undertaken by several Canadian stations, all on CW. Canadians will operate on a schedule and listen for callers on specific QSX frequencies in the US ham allocations. Station: VE3OT (Mitch) EN92 London, ON. Several US Experimental stations also will be in operation throughout the band, in two-way QSO mode with each other, using CW, PSK31, JT9, and QRSS modes. Some stations will also use WSPR and QRSS CW beacon modes. “The success of this event largely depends upon the participation of as many amateurs as possible,” Raab said. 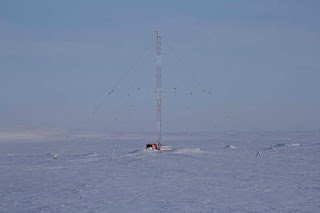 “We hope that you can find a few hours to participate in this unique midwinter event.” Submit reception reports via e-mail to the respective operators or via the ARRL 600 Meter Experiment website. Hopefully you will be able to participate in the crossband activity by being able to listen on 630m and then able to switch over to HF to transmit. This could involve the use of a separate receiver / transmitter or can often be easily implemented via your transceiver's 'A/B' switch. No antenna for receiving on 630m? Surprisingly good results can often be had by using a low band wire antenna such as a dipole or inverted-L for listening on 630m ... the antenna does not necessarily need to be resonant. In fact, often times, a non-resonant receiving antenna can provide a better overall S/N ratio than one which is resonant, as these often gather more noise along with signals. 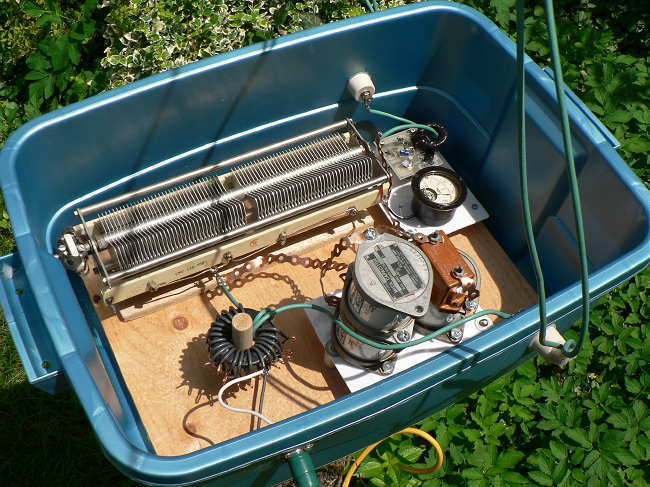 You may want to experiment before hand by listening to many of the numerous U.S. experimental stations operating nightly, mostly in the WSPR mode, between 475.6 and 475.8kHz. Most operators provide a CW identifier following their WSPR transmission but a better way to decode these signals is by installing the latest WSPR software, WSJT-X (freeware), at K1JT's website here. The software works extremely well and is easy to install and get working. If you set the software to 'upload spots', you can share your nightly catches with dozens of other listeners throughout the continent on the WSPRnet website. I'll be sending out a few more reminders as the 630m Activity Weekend gets closer but please mark your calendars and make a date to participate, by either sending in your 'heard' reports or by getting on-the-air and working some of the Canadian crossbanders. Another New VE on 630m! 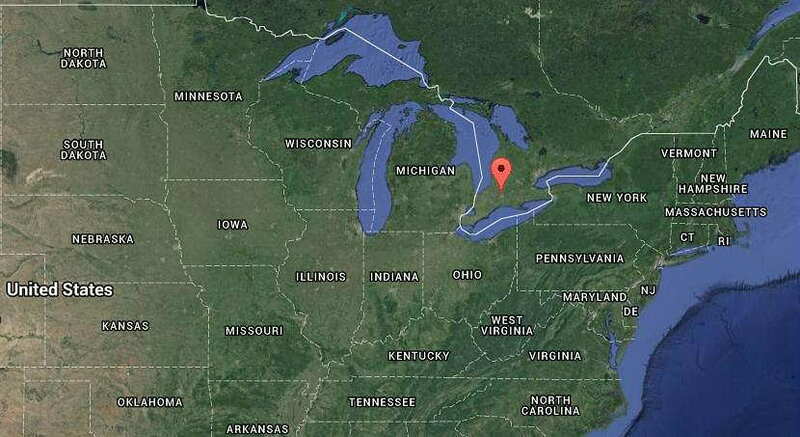 Another new Canadian station has been activated on 630m ... VE3OT, Mitch, in London, Ontario. 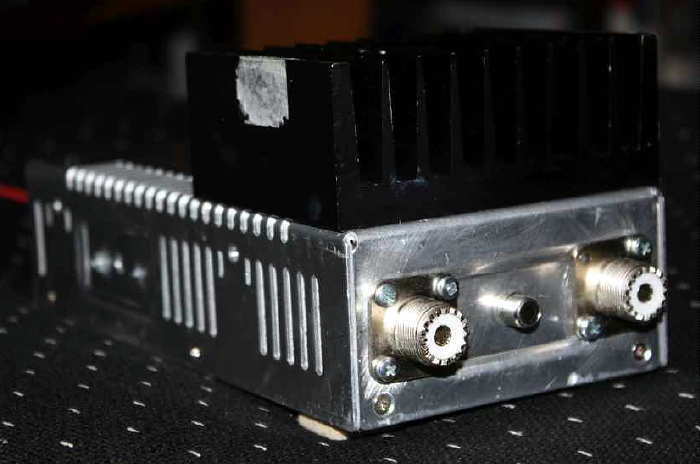 For many years, Mitch has been running his QRSS 'MP' beacon on 2200m, using a large E-W wire loop and about 200 watts. The move to 630m uses the same transmitter with a retuned loop and new output LPF. 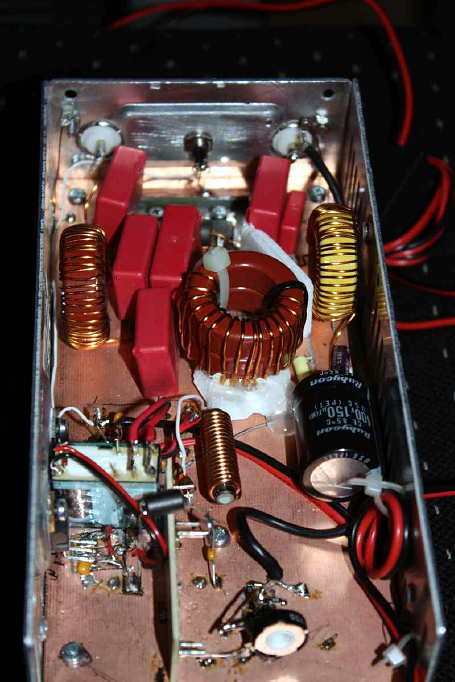 Although the antenna tuner still needs a capacitor swap and a new toroid to perfectly resonate the loop, Mitch has been getting many good 'audible' reports from eastern stations as well as from the central states and as far south as Texas. Present testing is in the QRSS6 CW mode on 475.0 kHz. 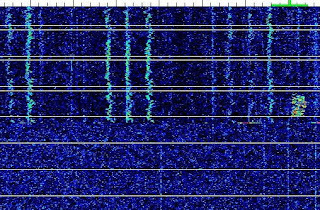 Unfortunately, since moving up to 630m, E-W propagation has been hit and miss and although I can copy his QRSS6 CW signal, I have not had aural copy as of yet ... maybe tonight. Hopefully when the geomagnetic field calms down again, Mitch can work some of the VE7's out this way on CW ... wouldn't that be a nice way to start the New Year! Another 630m CW crossband activity has been planned for early February and I will have more details shortly. If you missed the last event, here is another chance to get in on the two-way crossband fun ... please stay tuned! 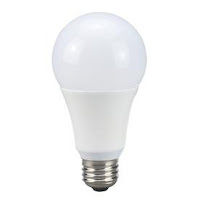 A recent posting by Phil, KO6BB, to Yahoo Group's ndblist, described his recent search for some LED lamps to replace the CFL's in his shack / radio workbench area. 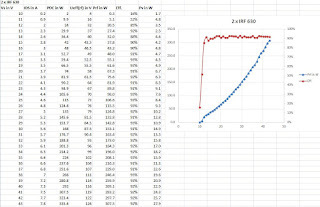 If you have been wondering how much RFI that LED lamps might be producing, you may find Phil's findings of some value. I had a 60W equivalent CFL in the floor lamp directly over my operating position. I'd tried a 100W equiv one but it was extremely noisy! Also a couple CFLs in the ceiling lamp. directly over the operating position work area (keyboard, radios etc). electronics are) about 7.5 inches (somebody asked about the distances). to avoid the REALLY cheap ones as some reported them to be 'noisy'. in the room. . . The ones I settled on were a brand I'd never heard of, "UtiliTech Pro"
75 W one draws 12W and gives 1100 Lumens. should then be 3200 Lumens if I calculated right). How low is the RFI to my Radios? the lamp, move it a couple inches away and the noise disappears. radio right up to the base of the lamps, not a likely real-world scenario! good value for the ~$30.00 I spent for three." I don't see these being sold here in Canada but I may be mistaken. If you have tested anything similar (other brands / models), please let me know and I will add it to Phil's helpful information. KO6BB's website can be found here, along with some of his homebrew equipment. I have seen on your Website, that you are also a MF/LF fan and builder of GW3UEP QTX. I build the version with 2 IRF540 as you proposed and the same version with 2 IRF630. As I bought some time ago a PSU with can be regulated from 1V to 60V and max 10A (it is a Manson HCS 3404) I made some measurements on both version. Find attached an Excel with the measurements I made, if you are interested in. If you use the IRF540 version you can see that if the power exceeds 100 W, the efficiency goes down, as the IRF540 is only specified for 100V. Currently I am using the IRF630 version running at 300W without problems. 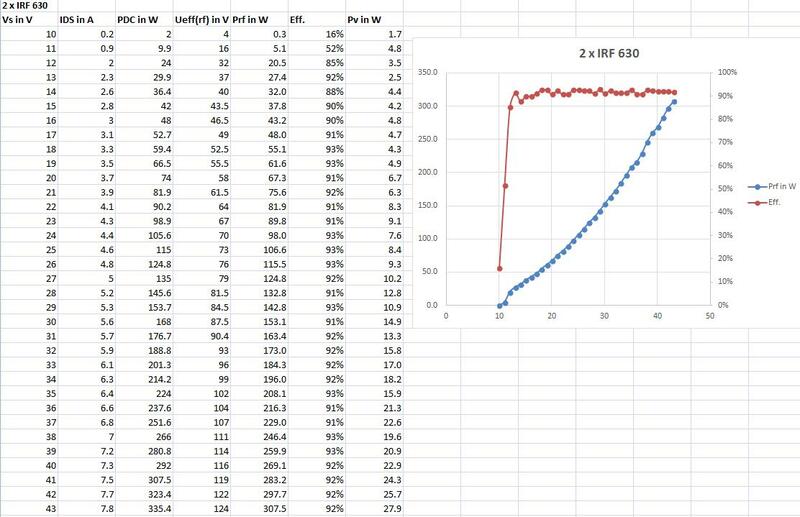 From Daniel's test data, it looks as though the IRF540's are quite happy as long as you keep the transmitter at 100W or less ... anything higher would certainly benefit from the switch to IRF630's as the high efficiency is maintained at least to the 300W level. Something at this level would no doubt benefit from higher-voltage capacitors and heavier inductors as well as a little more heatsinking, enough to shed at least 25 watts of heat between the two FETs. Daniel drives his amplifier with an Ultimate3, followed by a 10db attenuator, a squarer and into the totem pole driver stage. His own version uses toroidal inductors rather than the original air wound coils. A pair of GW3UEP amplifiers using IRF630's at ~40V into a small power combiner, should provide ~550W of useful output at >90% efficiency ... more than enough power to do some serious work on 630m.